Conversion rate optimization (CRO) boils down to two simple steps: Finding out why shoppers aren’t converting and fixing it so that they do convert. In ecommerce, the best way to increase conversion rate is to thoroughly understand each step of the shopping experience, find out where it’s driving consumers to disengage, and implementing adjustments until this workflow is a conversion machine. Wash, rinse, and repeat. Yep, it really is that simple. Which is why so many people think they need to make it more complicated it in order for it to work. If you’re looking for answers as to why your conversion rate is dropping, or was never up to snuff in the first place, follow our guide as it takes you through product description optimization tips, pricing tactics, effective email marketing strategies, and more to boost your ecommerce conversion rate. People have an innate fear of missing out (FOMO). Providing proof that a consumer’s peers are loving your products is a great conversion tactic that leverages this feeling. Social proof comes in several varieties, including testimonials, product reviews, and celebrity endorsements. Research shows that ecommerce stores that use videos and images of real people are considered more trustworthy. Kill two birds with one stone and generate social proof as well as boost trustworthiness by asking happy customers to include real-life pictures and videos of themselves using products. By curating user-generated photos, the online clothing rental shop Rent The Runway saw a 200 percent increase in conversions. One-third of all time spent online is spent watching videos. And good thing, because it’s thought that ads in video format increase purchase intent by 97 percent. What does that mean? That it’s time to insert video in your marketing materials—and especially your product descriptions—to deepen shopper engagement with your business and your products. As shoppers, we tend to care more about how a product will benefit us, not a list of features that don’t make much sense until we have the product in our hands. The best way to tackle this conversion tactic is to list out all the features and then write down what these features actually do for existing or ideal customers. For example, a shopper might not know what your “patented quick-release technology” actually does just yet, but they’ll appreciate that it makes it safer and easier for their kids to use without pinching their fingers or needing supervision. There’s not necessarily anything wrong with having plenty of content on your ecommerce platform, but if you’re wondering why your conversion rate is dropping it could be about what it’s saying. Like design and calls to action (which we’ll explore later in this piece), every element of your messaging should have a single goal—pointing readers directly to the conversion you want them to make. If people aren’t converting, it may be because their experience doesn’t align with the promise you made to attract them to your website. Make sure that your marketing messaging—be it email marketing, PPC ads, landing pages, etc.—aligns with the experience consumers receive the moment they arrive at your digital property. This is called message match, and getting it right could boost your conversion rate by over 200 percent. Sorry, but “Learn More” doesn’t work Every. Single. Time. Switch up the language on your calls to action (CTAs) so that they’re not only more interesting but they’re also more informational. Consumers want to know if the click of that button is going to charge their card or just take them to a more detailed product page. Action-inspiring language can inspire, well, action—which is exactly what you want when your focus is on conversions. Charm pricing is an age-old ecommerce tactic. And that’s because it works. Charm pricing is the practice of ending a price in an odd number—typically 9. So instead of a product costing $10, it would cost $9.99. Price anchoring is the practice of quoting a higher price just to drop it before closing the sale. This has the effect of both positioning your product as higher quality (for many consumers, cost = quality) and your brand as a source for incredible deals. Just be careful that you don’t lower your prices so much that you aren’t able to turn a profit. Over 60 percent of shoppers visit an ecommerce site just to compare pricing. So, as long you have the kind of margins that will allow it, pricing in accordance with your competition is a great way to boost conversions. Remember that fear of missing out? You can tap into a shopper’s need to feel included by offering them a special deal—but only if they act now. FOMO can be fostered in your copy, on CTA button labels, and even by using a countdown or timer. Pages and products that convert follow a classic rule: Keep it simple, stupid! (Or K.I.S.S. if you’re feeling romantic.) Don’t ask shoppers to do more than three different things on the same screen where you want them to convert. In fact, only asking them to do one single thing is ideal. The best way to remove distractions is to cut any unnecessary links. Start with the top navigation, social media links, any links to offers other than the one you’re trying to sell, etc. Narrowed down your conversion options but still aren’t seeing the results you’re looking for? Now’s the time to dig into exactly what actions consumers are taking on your website or app. Look at heat maps, funnel visualizations, clicks, and other analysis tools to determine what actions shoppers are actually taking and what you can do to direct them toward ideal conversion points. High bounce and exit rates usually mean you are failing to engaged visitors. And that usually means your conversion rate is low or will soon drop. Analyze your website and its audience to get a better understanding of what they’re looking for and where you’re failing to deliver. As more and more shoppers engage via mobile websites and apps, checking out the mobile shopping experience is a great place to start. 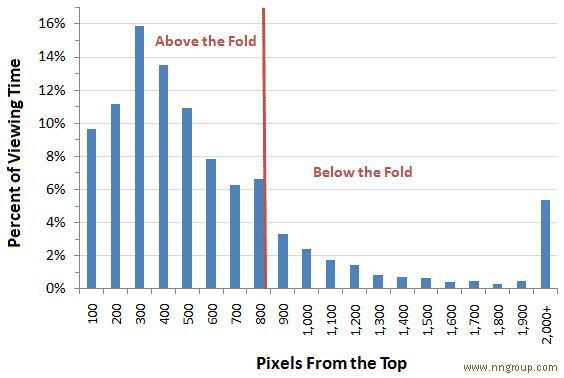 The world-leading user experience researchers at Nielsen Norman Group found that internet users still spend 80 percent of their time looking at information “above the fold”—or before they have to scroll to see more. Do everything you can to focus on sales and conversions in that area. Busy design is a distraction. And, as you probably know by now, ecommerce conversion rate optimization is all about minimizing distraction. Monitoring visitor behavior can tell you whether your design is one of the distractions. Research on ecommerce design can help you simplify to hopefully optimize conversions. Poynter Institute found that internet users instinctually look first at the largest and first elements on a website or app. Only after they’ve evaluated these elements do they decide whether they’re interested in engaging with the rest. This gives you the opportunity to establish a visual hierarchy that calls attention to important content and conversion points. Firebox.com is a great example. The product name is the largest font size with the CTA right behind. Supplementary product and tag information is smaller. You may think that showing the full expense of a product up front will spook shoppers. And while that may be true for bargain hunters, serious shoppers are more likely to complete their purchase if you’re transparent about pricing, and additional costs like shipping, from the very beginning. In fact, unexpected shipping costs are one of the main reasons shoppers abandon their carts. You may be able to dupe a few shoppers with hidden charges from time to time, but that’s a great way to erode trust and inspire bad reviews. First-time shoppers exercise a lot of faith when they decide to purchase a product they’ve never seen and share their payment details with people they’ve never met. Ensure them that they’ve made the right choice by using “trust markers” like security seals, guarantees, and badges that instill trust on the checkout page. Petco.com added $2.6 million in revenue after putting a simple “hacker safe” guarantee on their website. While we’re on the topic of checking out, don’t make people create an account to do it. Today, it’s common practice to be able to make a purchase with a guest account—or no account at all. Just ask clothing retailer ASOS, who cut cart abandonment in half after making registration at checkout totally optional. Cart abandonment emails give you the chance to convert shoppers who have logged in to your ecommerce platform, added items to their cart, but left without making a purchasing. These emails can recover as much as 15 percent of lost revenue. In fact, cart abandonment emails have the highest average conversion and click-to-conversion rates out of any triggered ecommerce emails. Abandonment emails, or a series of them, can help clear up any technical checkout issues, warn shoppers that their cart or their deal is about to expire, and even send an incentive to complete the purchase. Reaching back out to customers who’ve already purchased from you is a great way to boost retention and order value without shelling out any extra dough on advertising to attract new customers. Different consumers are quite often interested in different things, which you can deduce from their on-site (or in-app, or whatever) activity. Those who read reviews for an hour but don’t make a purchase may value a discount email while a regular, repeat buyer may appreciate emails about new products. Personalization is a huge trend as retail goes omnichannel. Use this tip to take advantage of it with email marketing. Already have customer support on staff? Then it’s time to take them online. Transactions happen fast in ecommerce. Shoppers want quick and convenient answers—give it to them with live, online chat support. Don’t have those kinds of resources? Look into chatbots as a way to boost on-site engagement before shoppers bounce. While on-demand support is awesome, sometimes it’s not sustainable. If you find yourself in that boat, try adding a section for frequently asked questions (FAQs) to your website to keep consumers engaged and increase their likelihood of completing a purchase. At the end of the day, ecommerce conversion rate optimization takes a lot of trial and error. Optimizing your product listings helps you display your products in the right way, to the right people, and on the right channels to maximize your conversions.